April Fool’s Day: Let’s Play ‘CRM Joke or No Joke’! 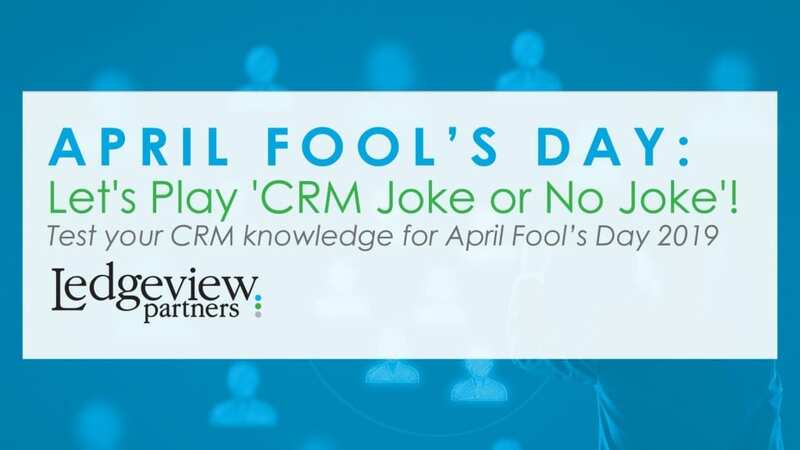 This April Fool’s Day, we invite you to play a round of “CRM Joke or No Joke” with us in honor of the spirit of the holiday. Before you pass along the link to this blog with your co-workers, use it as a way to start a conversation and test their knowledge of the system! Gamify your morning routine before you start logging in. Mondays are always a good day of the week for a refresher anyway, right? For the purpose of this post, answering “No Joke” means something is “True”. Answering “Joke” means something is “False”. Are you ready to test your knowledge and your co-workers’ about CRM in 2019? Let’s jump in! The answers are revealed at the bottom of this post. 1. JOKE OR NO JOKE: CRM is the 2nd largest software market in the world. 2. JOKE OR NO JOKE: 65% of companies that utilized mobile CRM in 2018 achieved their sales quotas. 3. JOKE OR NO JOKE: By 2018, the number of businesses using cloud-based CRM increased by 90% compared to six years ago! 4. JOKE OR NO JOKE: Every year, 75% of businesses say they plan to increase their spend on technology. 5. JOKE OR NO JOKE: It is projected that AI (artificial intelligence) associated with CRM activities will boost global business revenue by $1.1 trillion by the end of 2021. 6. JOKE OR NO JOKE: By 2020, roughly 12.86 billion installed bases of IoT (Internet of Things) will be used in the consumer segment (of CRM). 7. JOKE OR NO JOKE: The largest share of the digital marketers’ wallet in 2019 will go towards social media management software. 8. JOKE OR NO JOKE: Business reports show that 47% of businesses plan to increase their spend on CRM help desk and customer service software. 9. JOKE OR NO JOKE: 50% of CRM users access their systems from a smartphone. 10. JOKE OR NO JOKE: 91% of companies with 11 or more employees now use CRM software. 1. According to SuperOffice.com, CRM is now the biggest software market in the world, making #1 a JOKE! 2. SuperOffice.com reports that this is NO JOKE. CRM helps salespeople reach their quotas with more personalization and effectiveness. 3. This is a JOKE, but not by much. According to reports from SuperOffice.com, there was an 87% increase in 2018 compared to the previous six years in the number of companies that now use cloud-based CRM. 4. This is another JOKE, but not by much. According to reports from SuperOffice.com, 70% of businesses state this intention every year. 5. This is NO JOKE. IDC White Paper reports these (impressive) findings exactly. 6. Again, this is NO JOKE. Statista confirms this data, and reports from Medium.com echo, “In 2019, IoT will profoundly impact CRM as the vast amount of valuable data gathered from customers and potential customers will dramatically improve and enhance the function of CRM”. 7. This is a JOKE. Of the respondents surveyed in a recent study by StrongView, 60% reported they planned to increase their email marketing budgets in 2019. 8. This is NO JOKE. Reports from SuperOffice.com stated that improving customer service is not the only important consideration for businesses, but providing online self-help options is also crucial. 9. This is a JOKE, but, again – just barely. Data from Software Advice showed that 48% of CRM users access their systems from their smartphones and 45% access from a tablet. Meanwhile, 81% of users access CRM from multiple devices, with a majority that default to a desktop computer or laptop. 10. Finally, this is NO JOKE. These are the facts, people! More businesses are moving to CRM, and for so many good reasons to help increase efficiencies, boost their bottom lines, drive growth, increase retention rates, and much more. CRM is not only here to stay, but it’s also continuing to grow and thrive in new, exciting, and interconnected ways. Thanks for playing this game with us. We hope you enjoy your April Fool’s Day and had fun with “CRM Joke or No Joke”. Learn more about how your organization can uniquely benefit from CRM here.